1 AI & Augmented Reality: Perhaps the limit of most people in regards to Artificial Intelligence is Siri, and Augmented Reality only means virtual reality gaming; but for a tech entrepreneur, it translates to a whole new world of opportunities. While computer programs get smarter, and begin to communicate with humans in a much more independent way; innovators are looking for new ways to make AI and Augmented Reality more applicable in everyday life. AI is closer than ever in making virtual reality a more realistic experience than our sensory limitations. 2 Quantum Computing: Among the very latest technology trends of 2016, quantum computing became a reality; becoming the new holy grail of technology. We now have the ability to enhance computers to millions of times the computing power of normal systems. Supercomputers may have stretched across entire rooms in the days of the past; but in the near future, we could be looking at handheld devices with computing capacities 100s of million times faster than even the best supercomputers we have today! 3 Data Sciences and Digitalization: In the last two decades, the concept of “Data” has changed drastically, and we now produce more data than ever before. According to Eric Schmidt (CEO of Google), we produce more data every other day than the sum total of information humankind has gathered since the dawn of civilization up to 2003! Big Data and management of this vast amount of information has become a science in itself; and every innovator is looking to make the next breakthrough in Data Sciences and Digitalization technology like cloud computing. 4 Internet of Things: This term is very popular in social media these days, but only a handful of people can truly grasp what the “Internet of Things” actually means in the real time. To mention the latest technology trends in 2016 without mentioning IoT is impossible; and it is as exciting as it is massive! The Internet of Everything literally means how devices like phones and computers have begun to synchronize with everything around us – from homes, to cars, to household and commercial appliances and machinery. 5 Cyber Security: For any tech entrepreneur, cyber security is a factor that will affect their professional endeavors in some form or the other. 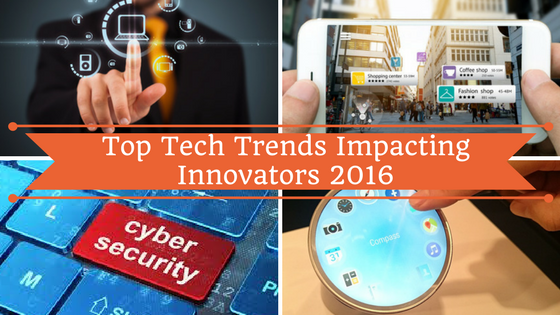 Whether it has to do with innovators looking for better ways to protect data, or whether your technology needs to be protected on a global digital system; Cyber Security moved leaps and bounds in the year 2016. In the year 2017, the market for cyber security is estimated to reach between $80 billion to $120 billion. 6 Smart Cities: Yes, we are not far from a world in which almost every aspect of human life is integrated on a digital platform; and the earlier topic of IoT explained a lot of this process. Cities will be integrated over one large digital medium which will revolutionize civilization itself. Smart Cities are already in their planning phase, and the biggest tech corporations are rushing in to make these cities of the future become something in the present tense! 7 3D Printing: If you have seen the popular HBO TV series ‘WestWorld'; you would understand how this is among the latest technology trends in 2016. If not, let’s just say it is only a matter of time till manufacturing is completely dominated by 3D printing technology for the most part! While 3D printing is not new in 2016, the great leaps and bounds this technology has taken in the last year is entirely revolutionizing the way people are looking at this method of production. From the printing metallic alloys, to printed food products; 3D printing seems to be something any major technology company needs to pay close attention to in the coming years.